As the debate on the new Constitution forges ahead many socio political and historical complexities in the Sri Lankan society seem to be coming into replay. With the difficult task of balancing the pride of the two main communities, the framers of a new Constitution no doubt have an uphill task. The upcoming three day debate in the Parliament starting on Monday will throw much light on the many sides of this complicated issue and will be a turning point in the whole exercise for finding a lasting solution to the northern issue among other things. Many who have commented, criticized or made irrational statements on the subject in the streets outside will have to stick to their points and behave in a more responsible manner in a parliamentary debate. Never in the past, a constitutional discussion has come this far. Neither has any incumbent government had shown such genuine desire to find a constitutional settlement encompassing the views of a wide section of the population. In that sense it will be a historic development irrespective of whatever the final outcome is going to be. This could be the fourth attempt to address the northern issue constitutionally preceded by the Constitution Draft Bill of 2000, Dudley-Chelvanayakam Pact and Bandaranaike –Chelvanayakam Pact. The difference is in all those previous instances there was no public discussion or debate. While the 2000 draft was rejected by the Parliament the others were withdrawn in the face of public antipathy. On the contrary this time the matter came to the centre stage in quite a different way as a major electoral promise by the coalition of political parties that was voted into power in January 2015. The constitutional process began in January 2016 with the appointment of a Consultation Committee by the Cabinet to seek the views of the people. This mechanism paved the way for wide and active public participation and a culture of inclusiveness. The mandate of the Public Representation Committee was to seek oral and written submissions from the public on constitutional reforms through public consultations throughout the country. The next phase of the constitutional reforms began with the passage of the Parliamentary Resolution of 9th March 2016 known as Framework Resolution which established the “Constitutional Assembly” and its procedure for drafting a Constitutional proposal. The Constitutional Assembly sits as a separate body consisting of all Members of Parliament and has powers that are similar to the powers of a Committee of the whole Parliament. The sessions of the Constitutional Assembly are conducted inside the Chamber of Parliament. In terms of the Framework Resolution the Speaker of Parliament is the Chairman of the Constitutional Assembly and is assisted by seven Deputy Chairmen who are elected by the Assembly. At the first sitting of the Constitutional Assembly on 5th April 2016, the seven Deputy Chairmen were appointed together with the Steering Committee of the Constitutional Assembly. The Steering Committee is responsible for the business of the Constitutional Assembly and for preparing a Draft of a Constitution for Sri Lanka. 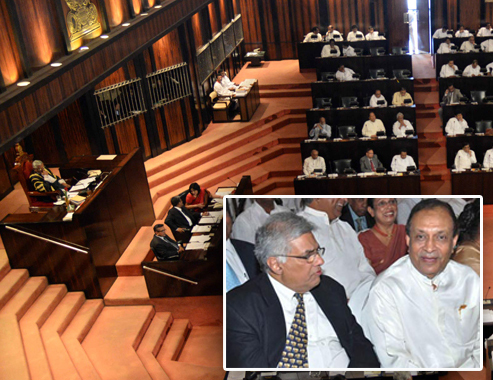 Accordingly, on 5th April 2016 the Constitutional assembly appointed a Steering Committee chaired by Prime Minister Ranil Wickremesinghe and consisting of 21 members representing all political parties present in Parliament. The Steering Committee is aided by six Sub-Committees each comprising 10 members and a Chairperson appointed in terms of the Framework Resolution. The six Sub-Committees were appointed on 5th May 2016 by the Constitutional Assembly and were assigned to deliberate on areas of Fundamental Rights, Judiciary, Law and Order, Public Finance, Public Service, and Centre-Periphery Relations. The deliberations of the Sub-Committees included discussions with various stake-holders including political party representatives, members of interest groups and organizations that made representations to the Sub-Committees. Representations received by the Steering Committee from political parties, Provinces and interest groups were also referred to the six Sub-Committees for their consideration. In addition, interactive sessions were conducted among Sub-Committees with the participation of representatives from key sectors including Secretaries to Ministries, Senior Representatives of Provincial Councils (PCs), Heads of Departments, Senior Personnel from Independent Commissions and Civil Society representatives. The Final Reports of the six Sub-Committees that were submitted to the Steering Committee were tabled in the Constitutional Assembly on 19th November 2016. Based on these reports the Steering Committee prepared an Interim Report in relation to core subjects to be covered by a Constitution such as nature of state, sovereignty, religion, form of government and principles of devolution which also contains political party positions and observations made by members of the committee. It is this Report which was tabled in the Constitutional Assembly on 21st September 2017 that is going to be debated in Parliament and most of the outcry and noisy remarks made by various political groups in the country are referring to the content of this document which is only a bundle of proposals sometimes contrary to each other. This is far from a constitutional draft and the content is not something that has been secretly developed as portrayed by some. It is the outcome of a very transparent, systematic and democratic process well in tune with the accepted procedure for this kind of things worldwide. The only difference is that this sort of transparency and opportunity for public discussion was not provided in the failed 2000 constitutional draft bill, 2010 All Party Representatives Committee (APRC) proposals or in the instances where new constitutions were promulgated in 1972 and 1978. It was only the politicians who participated in these processes and public had little or no say. All these previous attempts suggest that there is a need for a new Constitution which had been recognized without any reservation by the respective Presidents and the governments that initiated these efforts. The Government’s Proposals for Constitutional reforms published in October 1997 in its preamble had recognized that “ravages of hostilities and armed conflict resulting in extensive loss of life, destruction and loss of property” had endangered “distrust and disharmony among the people and has impeded the Nation’s progress” while also stressing that it is essential to heal the divisions of the past and to establish a stable legal order in the form of a Constitution. The APRC Report of 2010 says that the President mandated the APRC to evolve ‘a home grown new Constitution’ which will provide ‘a comprehensive approach to the resolution of the national question’. These are clear admissions by the leaders at the time that there is a national issue which needs a constitutional solution. It is also noteworthy that 2000 constitutional proposals as well as the APRC proposals of 2010 had proposed abolition of the executive presidency and return to a parliamentary system. On the issue of the unitary status of the state the year 2000 constitutional draft had referred to the state as ‘an indissoluble union of Regions’ while the APRC Report of 2010 had proposed to retain the word ‘unitary’ while it was not proposed to alter the foremost place given to Buddhism in both these instances. There has never been any unanimity in these sensitive areas and naturally the current set of proposals in the Steering Committee of the Parliament will also have all these different ideas from federalism to unitary state, from foremost place to Buddhism to secularism or from retaining executive presidency to parliamentary system. In the end what is best for the country is to debate all these ideas extensively and to come up with some consensus and the three day debate in Parliament can be a good starting point. There could be a vast difference between the document that is debated and a final draft and with that people on both sides will know their practical limitations and that itself is a great step towards reaching some consensus.